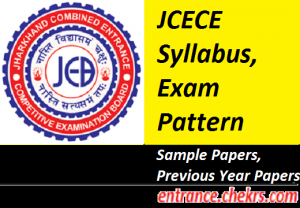 JCECE Syllabus, Exam Pattern (जेसीईसीई सिलेबस, परीक्षा पैटर्न) 2017: All Candidates those are looking for the Syllabus of JCECE 2017 can check here all the information. 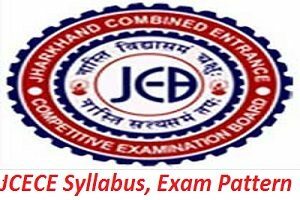 You can go through the JCECE 2017 Syllabus for making the high score in the JCECE Exam. This is a state level exam and a large no of the candidates apply this exam application form. Only the selected candidates will take the admission in B.tech courses. You can also become familiar with the Exam Pattern of JCECE 2017. You can also check here the Seat Allotment of JCECE 2017 below on this page. The syllabus of JCECE 2017 will help to pass the exam with good score. All aspirants can check here the Syllabus of JCECE Exam 2017 for passing the cutoff marks of the exam. In this exam, the questions will be asked from the CBSE 10+2 level Physics, Chemistry, and Math Subjects. You can Also Download the complete syllabus in the PDF by the below-provided link. Without pass this exam you cannot take the admission. Aspirants need to check the Exam Pattern of JCECE 2017 for checking all the details of the upcoming exam paper. The exam pattern will be helpful for making the preparation according to the questions of exam. The exam pattern will be told that which types of the questions will be asked in the exam and what will be time duration, etc. The JCECE 2017 Exam Pattern is given below. The questions will be asked from the 12th class board exam syllabus. Exam mode will be offline. Questions will be asked from Physics, Chemistry and Math subjects only. Total no of the questions will be 150 questions 50 from each subject. Total rime duration of the exam will be 3 hours (180 minutes). One mark will be provided for each right answer and 0.25 marks will be ducted for each wrong answer. You need to fill the answer in OMR sheet. You need to check the Sample Paper of JCECE Exam 2017 for taking a view of the upcoming exam. You can also become familiar with the previous year papers for the practice of exam. The sample paper will be a help to find out the most important topics from the most questions will be asked? You can also find out your weak points of the syllabus and improve them for better performance in the exam. Candidates can learn also the time management by the practice of these things. The Seat Allotment of JCECE 2017 will be organized by the JCECEB for providing the seats to the selected candidates. Only selected candidates can participate in this process. The selection of the aspirants will be on the basis of JCECE Exam 2017. The exam community of JCECEB 2017 will be provided the seats to candidates according to their obtain marks in the exam. Its a great news for all those candidates who are searching for the effective and resulting study material to prepare themselves in a more end resulting approach for scoring JCECE qualifying marks. The questions that are included in JCECE Syllabus 2017 are from 11th and 12th standard syllabus of CBSE/ State Board exam. We are here to make the candidates aware of the JCECE 2017 Exam Pattern, the exam will be of 150 marks which contain 150 question from (P:C:M =50:50:50), each of 01 marks will be provided for each correct answer.